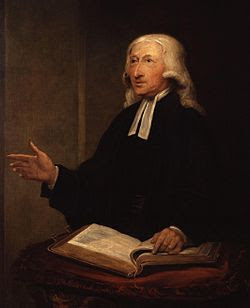 The Revd John Wesley (1703-1791) was an Anglican priest and theologian who is seen – alongside his brother Charles Wesley – as the founder of Methodism. 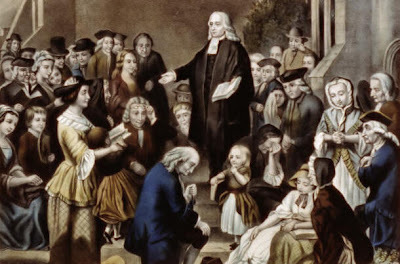 His sermons are a key to understanding Wesley, for Methodism began when he took to open-air preaching, albeit reluctantly at first. His great contribution was to appoint itinerant preachers who travelled widely to preach as well as to evangelise and to care for people. Wesley was a fluent, powerful and effective preacher. He usually preached spontaneously and briefly, though occasionally at great length. His written sermons are characterised by spiritual earnestness and simplicity. They are doctrinal but not dogmatic. Both his Notes on the New Testament (1755) and his Sermons are doctrinal standards for Methodists. The following discourse was written above five-and-fifty years ago, for the use of my pupils at Oxford. I have added very little, but retrenched much; as I then used more words than I do now. But, I thank God, I have not yet seen cause to alter my sentiments in any point which is therein delivered. 1788 J.W. “Do this in remembrance of me.” Luke 22: 19. I. I am to show that it is the duty of every Christian to receive the Lord’s Supper as often as he can. 1. The First reason why it is the duty of every Christian so to do is, because it is a plain command of Christ. That this is his command, appears from the words of the text, “Do this in remembrance of me:” By which, as the Apostles were obliged to bless, break, and give the bread to all that joined with them in holy things; so were all Christians obliged to receive those sign of Christ’s body and blood. Here, therefore, the bread and wine are commanded to be received, in remembrance of his death, to the end of the world. Observe, too, that this command was given by our Lord when he was just laying down his life for our sakes. They are, therefore, as it were, his dying words to all his followers. 2. A Second reason why every Christian should do this as often as he can, is, because the benefits of doing it are so great to all that do it in obedience to him; viz., the forgiveness of our past sins and the present strengthening and refreshing of our souls. In this world we are never free from temptations. Whatever way of life we are in, whatever our condition be, whether we are sick or well, in trouble or at ease, the enemies of our souls are watching to lead us into sin. And too often they prevail over us. Now, when we are convinced of having sinned against God, what surer way have we of procuring pardon from him, than the “showing forth the Lord’s death”; and beseeching him, for the sake of his Son’s sufferings, to blot out all our sins. 3. The grace of God given herein confirms to us the pardon of our sins, by enabling us to leave them. As our bodies are strengthened by bread and wine, so are our souls by these tokens of the body and blood of Christ. This is the food of our souls: This gives strength to perform our duty, and leads us on to perfection. If, therefore, we have any regard for the plain command of Christ, if we desire the pardon of our sins, if we wish for strength to believe, to love and obey God, then we should neglect no opportunity of receiving the Lord’s Supper; then we must never turn our backs on the feast which our Lord has prepared for us. We must neglect no occasion which the good providence of God affords us for this purpose. This is the true rule: So often are we to receive as God gives us opportunity. Whoever, therefore, does not receive, but goes from the holy table, when all things are prepared, either does not understand his duty, or does not care for the dying command of his Saviour, the forgiveness of his sins, the strengthening of his soul, and the refreshing it with the hope of glory. 5. In order to understand the nature of the Lord’s Supper, it would be useful carefully to read over those passages in the Gospel, and in the first Epistle to the Corinthians [1 Corinthians 11], which speak of the institution of it. Hence we learn that the design of this sacrament is, the continual remembrance of the death of Christ, by eating bread and drinking wine, which are the outward signs of the inward grace, the body and blood of Christ. II. I am, in the Second place, to answer the common objections against constantly receiving the Lord’s Supper. 1. I say constantly receiving; for as to the phrase of frequent communion, it is absurd to the last degree. If it means anything less than constant, it means more than can be proved to be the duty of any man. For if we are not obliged to communicate constantly, by what argument can it be proved that we are obliged to communicate frequently yea, more than once a year, or once in seven years, or once before we die Every argument brought for this, either proves that we ought to do it constantly, or proves nothing at all. Therefore, that indeterminate, unmeaning way of speaking ought to be laid aside by all men of understanding. 2. In order to prove that it is our duty to communicate constantly, we may observe that the holy communion is to be considered either, (1), as a command of God, or, (2) As a mercy to man. First. As a command of God. God our Mediator and Governor, from whom we have received our life and all things, on whose will it depends whether we shall be perfectly happy or perfectly miserable from this moment to eternity, declares to us that all who obey his commands shall be eternally happy; all who not, shall be eternally miserable. Now, one of these commands is, “Do this in remembrance of me.” I ask then, Why do you not do this, when you can do it if you will When you have an opportunity before you, why do not you obey the command of God. 3. Perhaps you will say, “God does not command me to do this as often as I can: “That is, the words “as often as you can,” are not added in this particular place. What then Are we not to obey every command of God as often as we can Are not all the promises of God made to those, and those only, who “give all diligence;” that is, to those who do all they can to obey his commandments Our power is the one rule of our duty. Whatever we can do, that we ought. With respect either to this or any other command, he that, when he may obey it if he will, does not, will have no place in the kingdom of heaven. 4. And this great truth, that we are obliged to keep every command as far as we can, is clearly proved from the absurdity of the contrary opinion; for were we to allow that we are not obliged to obey every commandment of God as often as we can, we have no argument left to prove that any man is bound to obey any command at any time. For instance: Should I ask a man why he does not obey one of the plainest commands of God, why, for instance, he does not help his parents, he might answer, “I will not do it now, but I will at another time.” When that time comes, put him in mind of God’s command again; and he will say, “I will obey it some time or other.” Nor is it possible ever to prove that he ought to do it now, unless by proving that he ought to do it as often as he can; and therefore he ought to do it now, because he can if he will. 5. Consider the Lord’s Supper, Secondly, as a mercy from God to man. As God, whose mercy is over all his works, and particularly over the children of men, knew there was but one way for man to be happy like himself; namely, by being like him in holiness; as he knew we could do nothing toward this of ourselves, he has given us certain means of obtaining his help. One of these is the Lord’s Supper, which, of his infinite mercy, he hath given for this very end; that through this means we may be assisted to attain those blessings which he hath prepared for us; that we may obtain holiness on earth, and everlasting glory in heaven. I ask, then, Why do you not accept of his mercy as often as ever you can God now offers you his blessing; – why do you refuse it You have now an opportunity of receiving his mercy; – why do you not receive it You are weak: – why do not you seize every opportunity of increasing your strength In a word: Considering this as a command of God, he that does not communicate as often as he can has no piety; considering it as a mercy, he that does not communicate as often as he can has no wisdom. The case is this: God offers you one of the greatest mercies on this side heaven, and commands you to accept it. Why do not you accept this mercy, in obedience to his command You say, “I am unworthy to receive it.” And what then You are unworthy to receive any mercy from God. But is that a reason for refusing all mercy God offers you a pardon for all your sins. You are unworthy of it, it is sure, and he knows it; but since he is pleased to offer it nevertheless, will not you accept of it He offers to deliver your soul from death: You are unworthy to live; but will you therefore refuse life He offers to endue your soul with new strength; because you are unworthy of it, will you deny to take it What can God himself do for us farther, if we refuse his mercy because we are unworthy of it. 10. We see then how weak the objection is, “I dare not receive [The Lord’s Supper], because I am unworthy.” Nor is it any stronger, though the reason why you think yourself unworthy is, that you have lately fallen into sin. It is true, our Church forbids those “who have done any grievous crime" to receive without repentance. But all that follows from this is, that we should repent before we come; not that we should neglect to come at all. 11. Others there are who, to excuse their disobedience plead that they are unworthy in another sense, that they “cannot live up to it; they cannot pretend to lead so holy a life as constantly communicating would oblige them to do.” Put this into plain words. I ask, Why do not you accept the mercy which God commands you to accept You answer, “Because I cannot live up to the profession I must make when I receive it.” Then it is plain you ought never to receive it at all. For it is no more lawful to promise once what you know you cannot perform, than to promise it a thousand times. You know too, that it is one and the same promise, whether you make it every year or every day. You promise to do just as much, whether you promise ever so often or ever so seldom. If, therefore, you cannot live up to the profession they make who communicate once a week, neither can you come up to the profession you make who communicate once a year. But cannot you, indeed Then it had been good for you that you had never been born. For all that you profess at the Lord’s table, you must both profess and keep, or you cannot be saved. For you profess nothing there but this, – that you will diligently keep his commandments. And cannot you keep up to this profession Then you cannot enter into life. 13. What has been said on this pretence against constant communion, is applicable to those who say the same thing in other words: “We dare not do it, because it requires so perfect an obedience afterwards as we cannot promise to perform.” Nay, it requires neither more nor less perfect obedience than you promised in your baptism. You then undertook to keep the commandments of God by his help; and you promise no more when you communicate. 14. A Second objection which is often made against constant communion, is, the having so much business as will not allow time for such a preparation as is necessary thereto. I answer: All the preparation that is absolutely necessary is contained in those words: “Repent you truly of your sins past; have faith in Christ our Saviour;” (and observe, that word is not here taken in its highest sense;) “amend your lives, and be in charity with all men; so shall ye be meet partakers of these holy mysteries.” All who are thus prepared may draw near without fear, and receive the sacrament to their comfort. Now, what business can hinder you from being thus prepared – from repenting of your past sins, from believing that Christ died to save sinners, from amending your lives, and being in charity with all men. No business can hinder you from this, unless it be such as hinders you from being in a state of salvation. If you resolve and design to follow Christ, you are fit to approach the Lord’s table. If you do not design this, you are only fit for the table and company of devils. 15. No business, therefore, can hinder any man from having that preparation which alone is necessary, unless it be such as unprepares him for heaven, as puts him out of a state of salvation. Indeed every prudent man will, when he has time, examine himself before he receives the Lord’s Supper. whether he repents him truly of his former sins; whether he believes the promises of God; whether he fully designs to walk in His ways, and be in charity with all men. In this, and in private prayer, he will doubtless spend all the time he conveniently can. But what is this to you who have not time What excuse is this for not obeying God He commands you to come, and prepare yourself by prayer, if you have time; if you have not, however, come. Make not reverence to God’s command a pretence for breaking it. Do not rebel against him for fear of offending him. Whatever you do or leave undone besides, be sure to do what God bids you do. Examining yourself, and using private prayer, especially before the Lord’s Supper, is good; But behold! “to obey is better than” self-examination; “and to hearken,” than the prayer of an angel. 16. A Third objection against constant communion is, that it abates our reverence for the sacrament. Suppose it did What then Will you thence conclude that you are not to receive it constantly This does not follow. God commands you, “Do this.” You may do it now, but will not, and, to excuse yourself say, “If I do it so often, it will abate the reverence with which I do it now.” Suppose it did; has God ever told you, that when the obeying his command abates your reverence to it, then you may disobey it If he has, you are guiltless; if not, what you say is just nothing to the purpose. The law is clear. Either show that the lawgiver makes this exception, or you are guilty before him. 17. Reverence for the sacrament may be of two sorts: Either such as is owing purely to the newness of the thing, such as men naturally have for anything they are not used to; or such as is owing to our faith, or to the love or fear of God. Now, the former of these is not properly a religious reverence, but purely natural. And this sort of reverence for the Lord’s Supper, the constantly receiving of it must lessen. But it will not lessen the true religious reverence, but rather confirm and increase it. 18. A Fourth objection is, “I have communicated constantly so long, but I have not found the benefit I expected.” This has been the case with many well-meaning persons, and therefore deserves to be particularly considered. And consider this: First, whatever God commands us to do, we are to do because he commands, whether we feel any benefit thereby or no. Now, God commands, “Do this in remembrance of me.” This, therefore, we are to do because he commands, whether we find present benefit thereby or not. But undoubtedly we shall find benefit sooner or later, though perhaps insensibly. We shall be insensibly strengthened, made more fit for the service of God, and more constant in it. At least, we are kept from falling back, and preserved from many sins and temptations: And surely this should be enough to make us receive this food as often as we can; though we do not presently feel the happy effects of it, as some have done, and we ourselves may when God sees best. 19. But suppose a man has often been at the sacrament, and yet received no benefit. Was it not his own fault? Either he was not rightly prepared, willing to obey all the commands and to receive all the promises of God, or he did not receive it aright, trusting in God. Only see that you are duly prepared for it, and the oftener you come to the Lord’s table, the greater benefit you will find there. 20. A Fifth objection which some have made against constant communion is, that “the Church enjoins it only three times a year.” The words of the Church are, “Note, that every parishioner shall communicate at the least three times in the year.” To this I answer, First, What, if the Church had not enjoined it at all, Is it not enough that God enjoins it We obey the Church only for God’s sake. And shall we not obey God himself If, then, you receive three times a year because the Church commands it, receive every time you can because God commands it. Else your doing the one will be so far from excusing you for not doing the other, that your own practice will prove your folly and sin, and leave you without excuse. 21. It has been shown, First, that if we consider the Lord’s Supper as a command of Christ, no man can have any pretence to Christian piety, who does not receive it (not once a month, but) as often as he can. Secondly, that if we consider the institution of it, as a mercy to ourselves, no man who does not receive it as often as he can has any pretence to Christian prudence. Thirdly, that none of the objections usually made, can be any excuse for that man who does not, at every opportunity obey this command and accept this mercy. 22. It has been particularly shown, First, that unworthiness is no excuse; because though in one sense we are all unworthy, yet none of us need be afraid of being unworthy in St. Paul’s sense, of “eating and drinking unworthily.” Secondly, that the not having time enough for preparation can be no excuse; since the only preparation which is absolutely necessary, is that which no business can hinder, nor indeed anything on earth, unless so far as it hinders our being in a state of salvation. Thirdly, that its abating our reverence is no excuse; since he who gave the command, “Do this,” nowhere adds, “unless it abates your reverence.” Fourthly, that our not profiting by it is no excuse; since it is our own fault, in neglecting that necessary preparation which is in our own power. Lastly, that the judgment of our own Church is quite in favour of constant communion. If those who have hitherto neglected it on any of these pretences, will lay these things to heart, they will, by the grace of God, come to a better mind, and never forsake their own mercies.